There are many legends of bothy lore, but who could have guessed an old zinc bath could be one of them? When I started writing about the Tarf Hotel so many people recalled that, in its wilderness years before the MBA started maintaining it, the bothy possessed the remnants of a central heating system… and a bath. Proof, if proof were needed, came with a photo by Graeme Hunter of someone ‘paddling’ it up the Tarf Water, back in the day of black and white photos. With writing as vivid as that, Bill should be writing his own blog (and, indeed, has written a few good pieces if you rake through the ukbothies forum), but his comment was followed by another great tale from the Two Kennys. The Two Kennys are Kenny Freeman and Kenny Ferguson, bosom buddies and bothy stalwarts who have been involved in a staggering number of bothy renovations and work parties in the Cairngorms. “At a weekend MBA work party around about 1994, an RAF helicopter that was supposed to be delivering materials was instead diverted to a rescue. So on the Saturday Stan Stuart, who was the MO [Maintenance Organiser with the MBA] at the time; Davy Miles, his best mate, who was MO for the Charr Bothy; Charlie Anderson, a joiner from Dundee who only had one eye and was probably one of the best story tellers I have ever come across; his mate who worked in a climbing shop in Dundee (whose name I don’t recall); Calum McRoberts, Irvine Butterfield, a lassie who wore a calliper on her leg and her pal who was diabetic (whose names I don’t know either), gathered up all the old pipework and metal that was strewn around the bothy. All the smaller pieces were buried in a large pit away from the bothy but the larger pieces, including the old bath, were piled up and ready to be flown out should the helicopter turn up. But there was to be no helicopter on the Saturday . Our mission for the work party had been to line the ceilings and replace rotten and missing floorboards, so when the chopper did arrived on the Sunday we had to go hell for leather to get as much of the work done before we had to walk out. Kenny Ferguson and myself could both remember seeing a copy of a pencil drawing in a book somewhere drawn, I think, by the Duke of Atholl, depicting himself in the bath at the bothy. So the two of us decided that the bath wasn’t rubbish after all and that it was, in fact, a piece of history and needed to be saved. Now it just so happened that Kenny was building his own bothy around the back of his house and I, being a cabinetmaker, suggested that I could turn the bath into an armchair to grace the newly built bothy. We managed to convince ourselves that the carry out would be worth it as not only would it look good in the new bothy but it would have a great story behind it. So, late on the Sunday, with huge rucksacks already full of tools, the two of us took turns with the bath strapped on to the top of our rucksacks, with the front just about covering our heads, making it difficult to see as we walked out. Bothy folk, you see. Can’t beat them. This entry was posted in Bothies, History, People and tagged bathtub, Bothy Ghost, Cairngorms, Kenny Freeman, Tarf Hotel. Bookmark the permalink. I think a picture of the bath in its current state is a must! I’m trying to figure out how you can get an armchair out of a bath and the curiosity is killin’ me… Come on, gies us a photie! Should be seeing at least one of the Kennys this weekend, Andy, and will ask them. Pretty curious myself, to be honest. I agree. A new bothy legend here I think. How many used for an old bath can you think of. I for one would never have thought of a chair! Aye, Aye boys. Current guardian of the auld Dukie’s bath here!The bath has had pride o place in my ane wee bothy oot the back gairden. However ye might be interested to know it has been wi me oot tae India a few years back (can provide the photographic evidence if anybody is interested). I packed it full o medical equipment I needed to teach a course in Tamil Nadu, and shipped it out ahead o my arrival. While there it came in very handy as there was a lack of facilities in the basic accomodation I wis stayin in. Aye, Kenny, I think now we really do need a photy. One of the bath as armchair and one of it on its holidays to India. India! What the hell was the postage on a tin bath???! Aye Neil. it wisnae me payin for it. Surely even better would be an appearance by the bath in person, as it were, at the AGM in Ballater – as the centre piece of a photographic display of all the work that been done in the MBA’s Eastern Highlands area over the last few years. Bugger! Ah’ve jist spat tea a’ ower ma laptop when reading aboot the Tarf bath’s holiday to India! To think it was less than a fortnight ago I believed that bath to be no more than a pleasant memory, and had already made its quiet withdrawal into myth and legend. Kenny Fergusson, ye’ve made my day, and I think the story o’ the Tarf bath should be enshrined in its rightful place, posted permanently on the wall of that 3 Star Bothy, the Tarf Hotel! 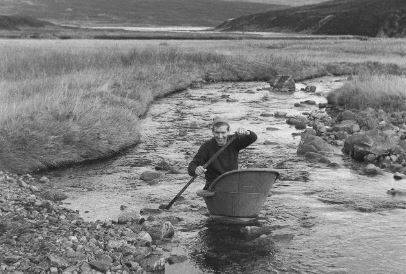 To be honest, the person paddling up the Tarf Water in 1965-6 id Jim Cornfoot of the Carn Dearg. I took to photo. It was hard going against the current! At that time there were beds (no mattresses), table, chairs and it was all wood lined. Thanks for that Graeme. I’ve now amended the photo caption. It’s amazing the interest there’s been in this bothy and its history. The Duke wasn’t very good at looking after his “tubs”. This one floated away from Blair Atholl in a flood, and was “found” and used by my forebears in the Tay estuary. No, it had been based at Blair Atholl, but swept down in a flood to the Elcho/Inchyra area east of Perth. It was too expensive to return, so was taken over by my family who lived and worked on the Tay. 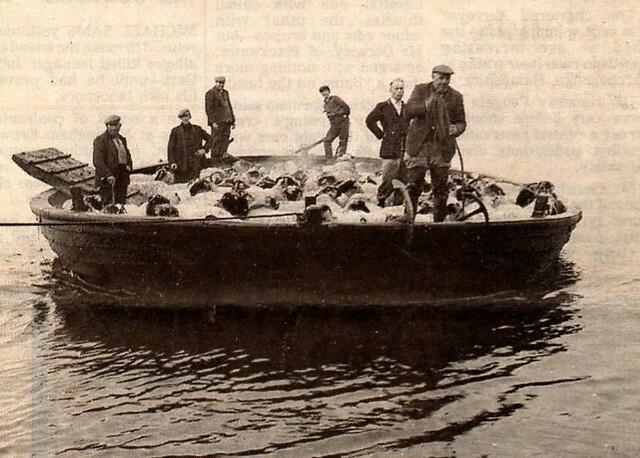 Here it is taking sheep to Mugrum Island around 1930. It was named the ” Largess of Atholl “, presumably by the new “owners” in irony.